The soundtrack of my childhood came through my brother’s piano in three threads: West Side Story, Scott Joplin, and Chopin. He played other things, but those are the ones I can still hear — and it’s Chopin that makes me feel five years old again. I would sometimes lie beneath the keyboard by the pedals with my back against the piano as he played nocturnes, picturing that tortured, tubercular Delacroix painting ^ on the cover of Ron’s music. Chopin is warm and dark and safe and sad to me, but it’s also the physical vibrations of that piano against my back. All that to say: I don’t approach Chopin objectively. The nocturne is meant to evoke the calm of night, and Chopin’s Nocturne in B-Flat Minor is no exception. But there are exceptions. When my son was four, he listened to a CD of Chopin nocturnes to go to sleep. That was fine until we left it running longer than usual and learned what Nocturne No. 13 does in the middle. Heh. 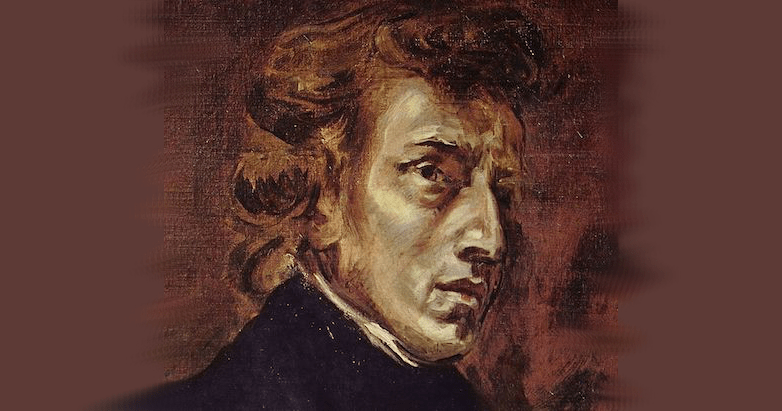 There’s a lot to talk about in the B-Flat Minor nocturne — including theorythings like the lowered sixth in major (0:29) and the spooky Neapolitan harmonies (1:11) that give Chopin his Chopiness — but I want to keep it short on these posts. The thing I love most about this one is his liberation of the melody from the beat. Instead of six notes per half bar, the melody bursts into this effusive chromatic flow of 33 notes where 18 “should” be. Those Chopinuplets are saying screw your strict divisions, my soul is singing. A great interpreter (like Rubinstein below) frees that spirit even further by stretching the beats, allowing all those notes room to breathe. That’s Romanticism, and it happens again and again in the 20 nocturnes. Now forget all that and enjoy.